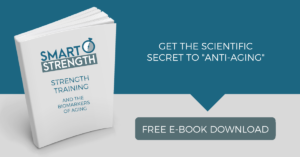 Want to know more about Smart Strength and how our resistance training programs can guarantee 50-100% strength gains in less than one hour per week? Smart Strength is a one on one training facility that was founded to fill the disconnect between what the scientific literature has shown to be safe and effective exercise, and what is often sold in my gyms. As a result, our clients train with us no more than 1 hour per week, with many training only 30 minutes per week, and they don’t suffer the injuries that so many people experience in traditional training environments. What makes Smart Strength Unique? Smart Strength specializes in high-intensity strength training, commonly referred to as SuperSlow®, Power of Ten, or Slow Burn, paired with therapeutic exercise when appropriate. High-intensity strength training is a safer, more effective, more efficient form of exercise. The complete total body workout lasts only 30 minutes, with many of our clients only coming once a week. Through compound movements on specialized equipment, the maximum benefits desired from exercise are achieved in minimal time. In addition, the facility is set up as the ideal environment to perform these workout. How do you create the Ideal Environment? Continuous Professional Supervision – Your instructor will monitor every aspect of your workout, never leaving to answer the phone or deal with other clients. The Best Equipment – We use Med-X, Nautilus, and ARX equipment, all of which has been modified to maximize our protocol. Environmental Control – The temperature is kept at a stable 66 degrees F. Research has shown that cooler temperatures maximize our ability to perform high intensity exercise. Exercise Physiologists are trained to conduct and interpret physical fitness assessments and develop exercise prescriptions for people who are healthy or have medically controlled diseases. As a result of the advanced training, we can ensure that you’re not trying to find a fitness solution to a health problem that requires proper attention from a physician. We’re used in a clinical capacity primarily for cardiovascular rehabilitation, though you’re also likely to see us alongside Physical Therapists in orthopedic environments, such as spinal rehabilitation. All of which is to say that we’re much more capable than your average personal trainer! The goal of Therapeutic Exercise is to restore the functional ability of the injured or impaired area. Specifically it is a musculoskeletal treatment prescribed in a measurable definable dose, conducted in a clinical environment; to prevent and treat muscular deterioration and health disorders caused by muscular atrophy and sarcopenia. Therapeutic is transparent with our exercise protocol. They are one in the same. Typically, therapeutic exercise is used pre-surgery to help jump start rehabilitation, and post-rehab, to pick up where physical therapy leaves off due to insurance restrictions. But still, all in less than an hour per week? “Train Hard, Train Brief.” The primary objective of exercise is to momentarily fatigue the musculature to stimulate a growth mechanism in minimum time. Our goal is not to make weights go up and down. To help wrap your mind around our concept, imagine running: there exists an inverse relationship between volume (e.g. running a marathon) and intensity (e.g. sprinting 100m). You cannot sprint a marathon, nor can you sustain a maximum sprint for more than a couple minutes.The exact same relationship exists in resistance training: you can work hard, or you can work long, but you cannot do both. In a Smart Strength training session, we make the work very intense through the slow movement and meaningful resistance. This eliminates acceleration and momentum which keeps the muscle under continuous load and more effectively fatigues the muscle, signalling to the body that it must grow stronger. Sending this signal to the body IS the main focus of each workout, as such we focus on quality over quantity. As a result, we obtain intensity without injury and deliver results you could never imagine in such a short period of time. Many women have a fear of “bulking up” from resistance training. And with the size of female bodybuilders displayed on covers of muscle magazines, on the surface, this fear seems realistic. The truth of the matter is that very few of us (male or female) have the genetic potential to get excessively muscular (especially without steroids). The genetic potential to get as big and muscular as a champion bodybuilder is estimated to be on the order of one in a million. So most of us can’t build really large muscles, even if that’s what we wanted. In fact, if you’re older than 25 and dissatisfied with your appearance, it’s more likely that too little muscle is the problem rather than too much muscle. Adults who don’t resistance train lose an average of a half pound of lean muscle tissue each year starting at age 25. This means a typical 55-year-old woman will have 15 pounds less muscle on her body than she did at age 25. Ask yourself – “Was I ‘big and bulky’ and too muscular when I was 25?” If you’re like most, you’ll probably answer, “No, I wasn’t too muscular at 25. In fact, I looked better than I do now.” Since most people’s waists, hips, and thighs are now larger than they were at age 25, this lost muscle tissue has often been replaced (and added to) with extra fat.If you can start replacing the muscle that you’ve lost, it will tone your body, as well as increase your metabolism to burn more fat. And since muscle is denser than fat, adding muscle and losing fat will make you smaller and firmer.